Sunbathing dinosaurs and artistic dinosaurs, dancing dinosaurs and volleyball-playing dinosaurs make learning opposites fun! From Boynton on Board, the bestselling series of extra-big, extra-fat, extra-appealing board books, Oh My Oh My Oh Dinosaurs! 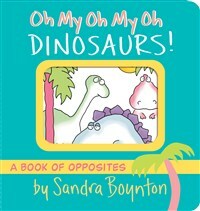 is a book of opposites featuring the inimitable Sandra Boyntonís colorful, humorous drawings and lively text. Main selection of the Childrenís Book-of-the-Month Club. Main selection of the Children's Book-of-the-Month Club. Suitable for ages 1-4.